Few Body Dynamics presents the proceedings of the VII International Conference on Few Body Problems in Nuclear and Particle Physics, held in Delhi from December 29, 1975 to January 3, 1976. Invited speakers talked about topics ranging from dynamic equations and approximation methods to computation and experimental techniques, few body bound states, breakup reactions and polarization, few electron systems, and photon and electron probes on few body systems. Speakers also covered few body reactions with mesons and resonances, few body aspects of nuclear reactions and scattering, three body forces in nuclei, and quark physics. Comprised of four parts encompassing 145 chapters, this volume summarizes the status and results from experimental facilities such as the Bhabha Atomic Research Centre in India, TRIUMF in Canada, and the Clinton P. Anderson Meson Physics Facility in the United States. It also discusses completeness relations in scattering theory for non-Hermitian potentials, ambiguities in phase-shift analysis, and parametrization of the half-shell function when the eigenchannel has a bound state. The next chapters focus on possible phenomenological forms for the two-body local potential, nuclear three-body forces arising from triple-boson couplings, and concepts such as N-particle transit operators, three-body separable expansion amplitude, the three-body problem with energy-dependent potentials, and the four-body problem. The book also introduces the reader to triton with realistic potentials, backward proton-deuteron scattering, and deep inelastic lepton-nucleon interactions at high energy. 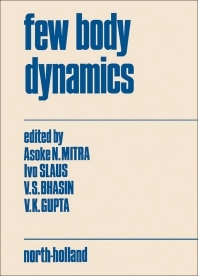 This book will benefit physicists, students, and researchers who want to learn about the dynamics of few body systems.